Keep your weekly four time-per-day medication regiment organized with the Mediplanner&reg; Deluxe/II. 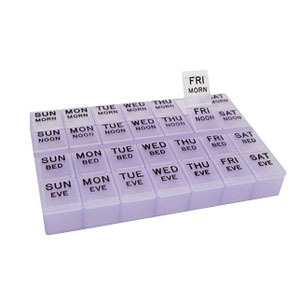 This secure and helpful pill organizer has four coded compartments and snap lids that are easy to read and will keep pills safe within a drawer or conveniently stored on your counter. 28 extra large compartments for multiple pill regimens. Large, easy to read lettering and braille markings.